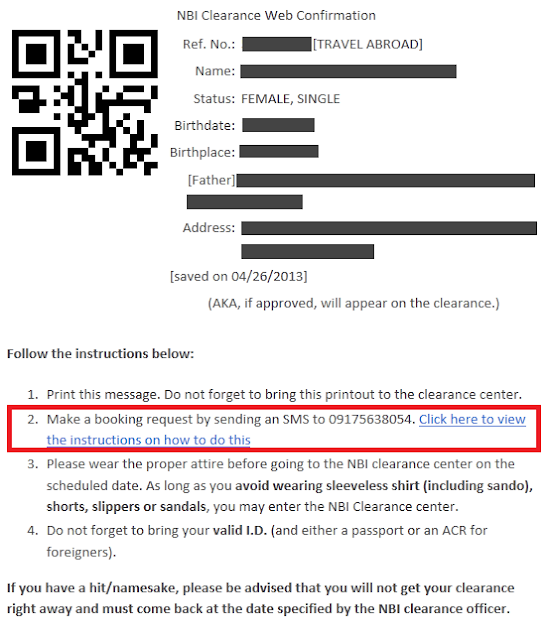 Senyorita Lakwachera: Claiming your NBI Clearance (Semi-online). On my previous post I shared you the steps and instructions on how to claim your NSO birth certificate via phone. 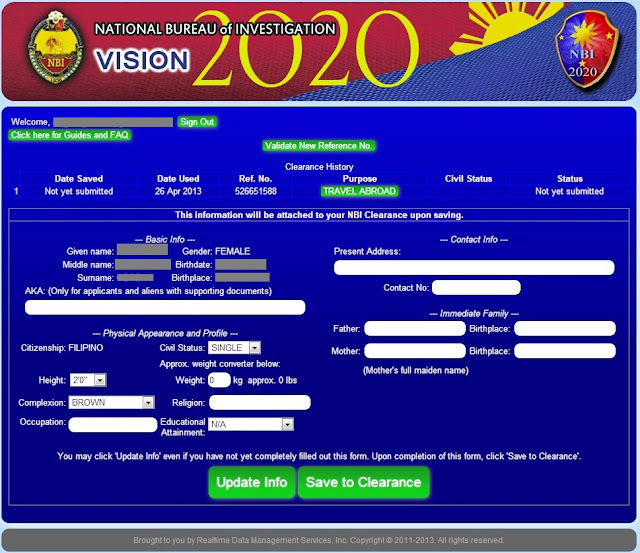 Today’s still a part of my passport application; I will share my own experience on getting NBI Clearance Online. This was the second time that the government impresses me how things got improved from five years ago – when I still have to fall in a long line at SM megamall to renew my clearance. Today, though the online processing is already up and running, a lot are still unaware of this basing on the number of people who still suffer the long line in the NBI Centers; reason why I am sharing this. Now here are the few steps to follow for a more comfortable way of claiming your NBI Clearance. STEP 2: When you already have the exact cost of the Clearance you need, go to the nearest G-Cash or PPP (Pinoy Pera Padala) outlet to pay the exact amount (E.g. Php140.00 for Travel and work abroad). Please note that the G-Cash or PPP charge service fee which is Php20.00 in our case as we chose G-Cash. 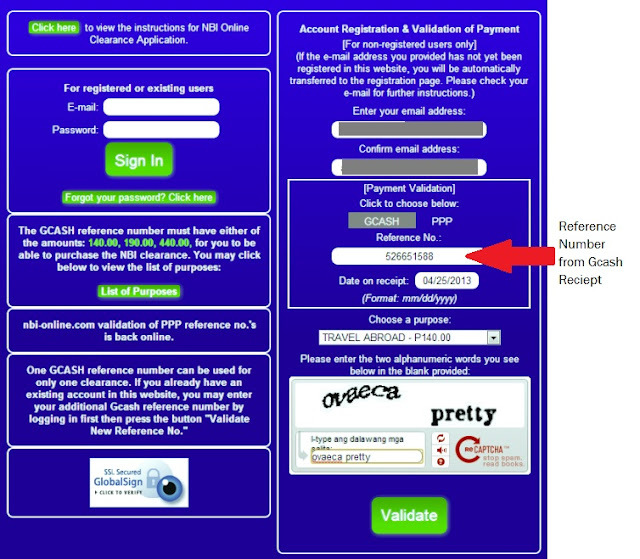 STEP 3: Secure the reference number and register on their homepage with your valid email address. 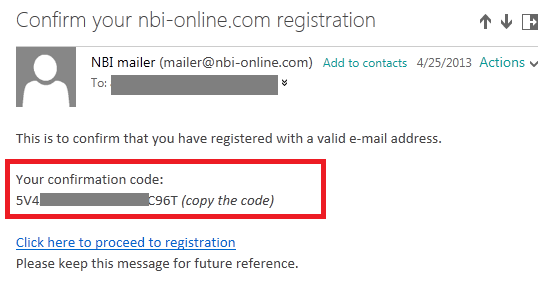 STEP 4: Open your email and verify the NBI Registration by entering the confirmation code provided in the e-mail message they sent to the e-mail address you provided. STEP 5: Fill up the form – make sure that all the information’s are correct before you submit it. STEP 6: After submitting the form you will receive a notification via email that include a printable page. You will need to print it and bring it with you when you claim your clearance. The email looks like the one I got below. STEP 8: Last step is go to the nearest NBI Center, bring with you two valid ID. Proceed to STEP 3 which is the Biometric scan and Picture taking (ha-ha). STEP 9: Your done just have to wait for the clearance. Waiting time per our experience is less than 5 minutes. Confused? got some questions or think that I forgot a step? Drop a comment and I will get back to you the soonest as I can. so pag punta sa "nearest NBI Center (I assume pwede sa malls)", does this mean there's a dedicated line and I don't have to line up anymore? Tomo - I remember those days na 6am palang ang haba ng pila sa megamall. will there be a dedicated line at the selected NBI center? Wala po. Bale may 3 kasing silang window Step 1,2 & 3. Pag dumaan ka online dun sa last step na agad ang pila mo. HIndi ka na dadaan ng 1 & 2 - yung first two steps kasi yung sobrang bagal eh. Hi. I want to ask if I can changed the date of my booking? That i am not sure of. But i believe you can. Kasi online process is matter of taking data lang naman. Hi.ask ko lang kung pwede ako hindi na magbook, diretso nalang sa pinakalapit na NBI. pwd ata kasi yung sister ko hindi na nagpabook eh. :) ayos naman. Hi, i just want to ask if you ever had a problem in terms of validating your account. I'm having a problem. It says i mistyped my reference number or the date, but i didn't. What am i suppose to? Is my payment being wasted? Help me pls. Thank u.
Hi... how can you register again to get another reference number? i have the same problem too... thanks. Hi.. how can i register again to get another reference number? i have the same problem too.. thank you. Hi. First of all, I appreciate what you did here. You helped me a lot. Secondly, did you receive a confirmation text after you sent your desired Date and Time to the given number? I noticed that the number where you are supposed to send the GCash and the number where you send in your appointment date and time. And it has been hours now and I still haven't received any confirmation texts..
And also, I'd like to add that when paying via GCash, omit the 2882 in the number. I got confused there for a while. Hi, thank you and i'm glad that it helped you. to answer your question, yes I did received a confirmation text regarding my desired appointment. for your second question, may I ask for the steps that you have taken so far. I didn't quite understand what you meant by it. Did you happen to pay thru any GCASH remittance center? So can I booked myself and do step 3 on the same day I did this online processes? for one instance I have seen two who did that in Robinsons Galleria, thought I am not certain if that is usual. San adress ko ippdala ung pera? hi what if d q xa mapuntahan s scheduled day and time makukuha q p din b xa sa mga susunod n araw? Pasensya na po, d ko masyadong naintindihan. Ibig nyo po bang sabihin eh mali yung reference number na nabigay sa iyo? Or may issue ang website kaya d niyo ma enter ng tama? ask ko lang may idea ka kung pano mag input ng special character sa registration na fill up mo online ayaw nya kasi accept ung ñ or Ñ na character e part sya ng middle name ko, na register ko tuloy is N instead of Ñ any idea? Hi, tanong ko lang po.. im from Bukidnon, pano mag text ng booking request? sa Cagayan de Oro City ang nearest NBI Clearance Outlet... Yung location code ang problema ko kasi..
Hi April, I am not sure yet but i guess u have to use the location code of Cagayan de Oro. I would love to verify that for you but i have a very limited resources right now. Currently working on phone. You may want to check directly to their support if there is any. Hi April - my apologies, but this service is center limited. Here are the updated centers that accept booking. Thanks for writing this...From the previous blogs/articles I read about online clearance,they only mentioned that you can claim your clearance in UN Ave in Manila...So, glad I found your blog(you mentioned in one of your replies that someone claimed theirs in Rob Galleria?). I'm hoping to make my appointment either in Rob Gale or Rob Metroeast (I'm from Antipolo). Hi! Ask ko lang any nbi center pwedi makuha nbi clearance or Manila lang pwedi. Im from Pampanga kasi. Hi!ask ko lang any nbi center you can get nbi clearance or in Manila lnga? Im from Pampanga kc wla kasi sa location code. This might be helpful. For Gcash payment, you can use the reference number after 24 hours from time of payment. You will get error: Please confirm your reference or you mistyped reference blah blah. if you will use it right away on line. The reason behind this is to give ample time for nbi to recognize your payment. Just sharing -- when I did my NBI e-clearance I payed around 5.30PM, and wasn't able to register in the website until around 5AM the next day. From doing a little research, this delay is probably due to capacity issues on NBI's end. Also, NBI e-clearance is not accepted in all NBI Centers, so unless you want to gamble, just book/proceed to one of the listed satellite centers. San NBI ka nakakuha? :-) listed ba yung center? Nakuuu *-* di ko rin alam pano yan... natry mo na ba yesterday? baka sakaling dahil weekend. Hi, I am suppose to put passport requirement in the purpose box. Which purpose should i pick (there's only PASSPORT RENEWAL and OTHER REQUIREMENTS choices available) Thanks. PS: SM North department store Gcash outlet doesn't accept NBI clearance cash ins for quite some time already according to the lady I spoke with due to transaction problems. Not sure if other SM department stores has that problem. Hi! The post and comments are very helpful. I would just like to ask, how long did it take for you to complete the whole process (from step 3 to release of clearance)? I'm planning to go to Robinson's Galleria and I need to manage my schedule. If you could also give a tip what time is advisable for faster transaction..
you can pay and get your NBI E-clearance reference number at any Kwartagram Outlets. visit to know the outlets nearest you. Again the additional services they are offering is only OPTIONAL. You may only get the reference number and do the encoding and printing by yourself. However you can pay and get your NBI E-clearance reference number at any Kwartagram Outlets. visit http://www.kwartagramcorp.com/index.php/services/nbi-e-clearance-payment to know the outlets nearest you. Hi! Just want to ask, what if I'm going to use my married name, what are the requirements needed? IDs available are with my married name are: SSS and Company. Do I need to bring my old NBI Clearance with my single name? What if my single name was a HIT before, is there a possibility that my married name will be on HIT too? Hi! Would like to ask, what if I will be requesting an NBI e-clearance using my married name, are there any requirements? My supporting documents available for my married name are: SSS, Company and MC. What if my single name was a HIT? Does it mean that my married name has a possibility to be a HIT? Also, can I request for my own schedule of appointment or the online registration automatically assigns when I should go to the Satellite Office chose? Hi! If I may ask, did the guard (or anyone from the NBI center in Rob Galleria) ask you if you have scheduled an appointment, or you just said presented your NBI e-clearance QR code? No, we were not asked. We just told them that we did the online process then we were directed to step three. But that was way back. Baka madami na nag online ngayun giving them the need to enforce the booking process. good day! would like to ask, can i proceed to the branch even if i haven't received a confirmation from my sms booking? i made booking last Monday, Nov. 11, 2013 and until now i haven't received a text confirmation. my requested schedule is on Nov. 15, 5pm. Ask ko lang if this online process is the same as renewal online? Thanks! Hi? ask lang po ako.Tapos n akong magbayad through BDO last feb.18,2015 then wala pa po yong confirmation code ko so paano po yun? I doubt po.. kasi naka per appointment sya. Hi. Nagapply kasi ako sa NBI MANDALUYONG CITY HALL. Possible po ba na makuha k pa yung nbi clearance ko kasi nakalimutan ko siya Ipick up sa binigay sakin na date? Hi ask ko lang..may resibo na ako paid last july.. can i still claim my clearance today using same receipt? Good day po .. pwede po ba makuha yung registered online nbi clearance sa kahit anung branch ng nbi? salamat po sa mabilis na sagot .